Just as we’ve discovered the power to solve our personal issues lies right within ourselves through the power of our mind and thoughts which create our world, we are also becoming aware that the best anti-aging regimen begins within the body and consists not only of a diet rich in nutrients but a lifestyle that includes the right kind of exercise. 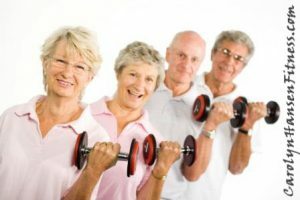 Strength training is at the top of the list of important things you can do that help to slow the aging process from within. Let’s face it, it’s literally impossible to look youthful without good muscle tone and strength training is the only activity that can give you back that younger, youthful body and stop the ageing process dead in its tracks. Although any kind of activity is good for you including all recreational activities such as walking, jogging, or cycling only strength training (also known as resistance training) will stimulate the release of human growth hormone (HGH), the hormone that helps your body build youthful muscle tissue and use up excess flabby body fat. HGH regenerates and repairs your cells. It makes your muscles firm, your skin tighter, bones stronger and joints healthier. It maximizes muscles and minimizes body fat creating a nice hourglass shape for women and a powerful superman-style V-shape for men. Unfortunately, we do not retain the same levels of HGH throughout our life and as we pass age 25 our HGH levels begin to plummet. By the time we reach our 40’s, HGH dips to just 40 percent of what is was at age 20 and when we reach our mid-fifties, it shrinks to a measly 20 percent of what it was. Proper strength training holds the key to boosting HGH levels by as much as 300 percent as well as slashing the risk of death from diabetes, disease and cancer. The problem is, too many people are doing the wrong kinds of exercise, the kind that barely moves the HGH needle. The answer lies in using incredibly efficient and effective movements that simulate a huge surge in HGH in a very short period of time. It is the bare bones kind of “no fluff” exercise that must be adopted and performed if you really want to turn back the clock. Strength training uses resistance of some kind to strengthen and condition the muscular system. This is achieved using free weights, resistance machines or even body-weight exercises. The amount of resistance a muscle has to work against is important because it determines how strong it is in the end. Because it really gets our blood pumping (one of the most valuable anti-aging tools), proper resistance exercise makes us feel alive. Because we feel better and stronger, it enriches our life so that we do and experience more. Studies suggest that all it takes is six to twelve months of consistent strength building exercise to reverse decades of muscle loss. That means it’s never too late to start and with dedicated, consistent training you won’t have to wait long to see results. Once you feel and see the effects of proper strength training exercises, you won’t ever look for other quick fix temporary anti-aging methods. Slowing the aging process, boosting your energy levels, keeping your physical shape in check is not a huge mystery. It is the result of maintaining healthy high levels of HGH, the youth-enhancing hormone. It’s about balancing the activities of what you love to do with some challenging strength training and muscle toning exercises…never about giving up anything. If you love to jog, don’t eliminate it, just add a few challenging strength training sessions to your weekly schedule. If you’re searching for the perfect anti-aging formula and disease prevention, exercise, specifically strength training exercise …the kind that triggers HGH, is your fountain-of-youth. If you are serious about achieving a truly healthy lifestyle, one of youth and vitality, “Reclaim Your Longevity” was created specifically for you. It will absolutely help you in every area of your life to stay as young, healthy and vibrant as possible. All my products offer a whole body approach – one that supports both the body and the mind.